Arbi bhaji or Sukhi Arbi is upwas /fasting recipe. .Arbi can be used as a replacement for potatoes .You can have it with rajgira poori or singhare atta poor or kuttu poori or parathas.It is very easy to make and tastes great just by itself or as side item. 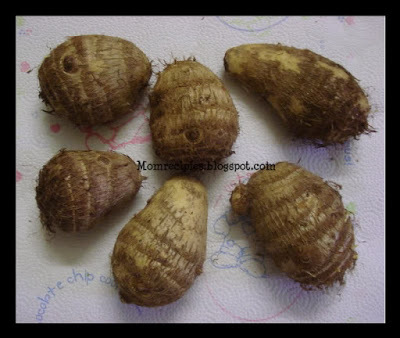 This arbi also can be served as starter or snack also. 1.Wash the Arbi (Colocasia)/Arum in running water properly and ensure their is no mud around it.Pressure cook arbi till two whistles. 2.Drain arbi .Once cool enough to handle peel of the skin. Slice arbi into halves. 3. Heat oil in a pan or kadai, add cumin seeds, carom seeds(ajwain) and allow to splutter. Add arbi pieces and saute in medium flame until golden brown .Turn to other side and cook for 2-5 mins till golden brown. 4. Keep the low flame . Add the red chili powder , coriander powder and sendha namak. Ensure that the spice powders do not burn. Mix them well. 5. Toss the arbi uniformly with the spice mixture. 7. Serve hot, with Kuttu Paratha or Kuttu Puri or Rajgira puri or Rajgira paratha or just plain as a snack.